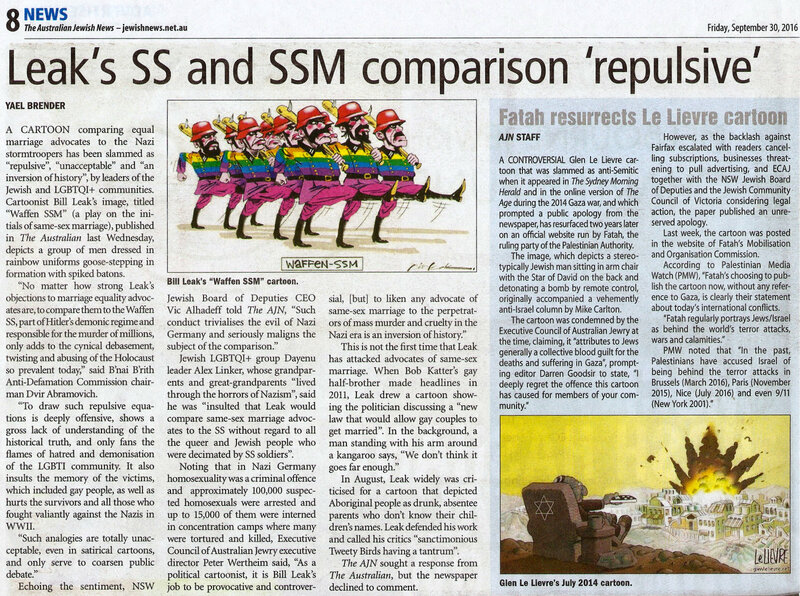 A selection of responses to Bill Leak’s “Waffen-SSM“ cartoon that were published in the Australian Jewish News. Click on each to enlarge. 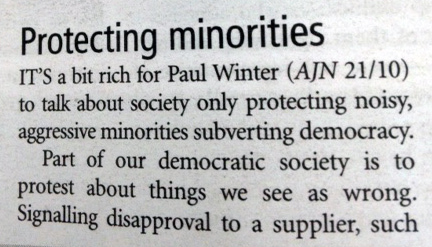 IT’S a bit rich for Paul Winter (AJN 21/10) to talk about society only protecting noisy, aggressive minorities subverting democracy. Part of our democratic society is to protest about things we see as wrong. Signalling disapproval to a supplier, such as a hotel, is a legitimate way to make it known that you disapprove of their business practices. Threatening people is never acceptable and every protest has those on the fringe. It’s unfair to suggest that all protesters hold the same opinions or use the same actions. Similarly, overlooking that a vast majority of Australians support marriage equality and that it’s a small minority of religious people who object is to ignore reality. As a society we must look after our minorities and listen to their needs so that people aren’t simply ignored or regarded as insignificant. The gay population is about two per cent, while the Jewish population is around 0.5 per cent. Minorities always struggle to have their plight seen as important by the larger population and struggle to gain recognition and relevance in a world that mostly considers minorities unimportant. 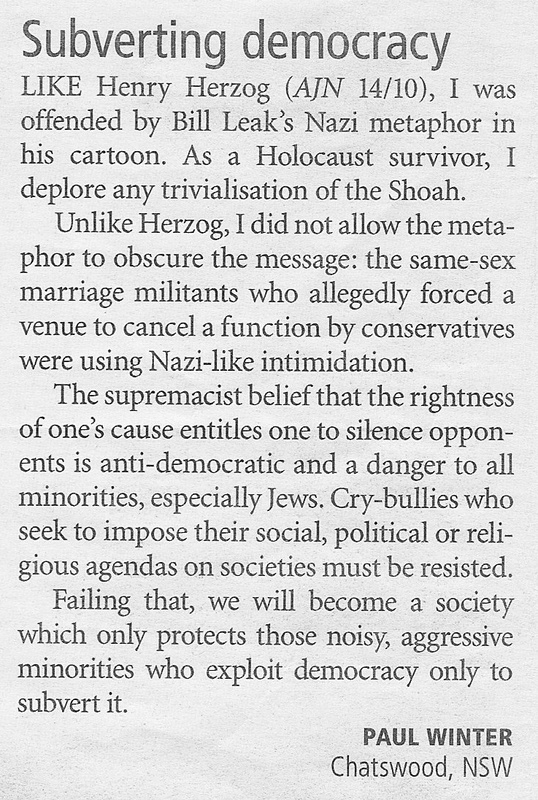 In his letter, Geoff Bloch (AJN 14/10) downplays the obvious Nazi connections with the Leak cartoon. He said that the cartoon did not depict marriage equality advocates as Nazis, seeming to avoid the only words written on the cartoon “Waffen-SSM”. 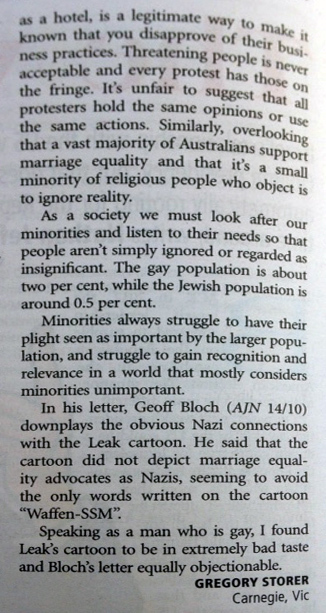 Speaking as a man who is gay, I found Leak’s cartoon to be in extremely bad taste and Bloch’s letter equally objectionable. This entry was posted in GLBTIQ, Human Rights, Politics and tagged Australian Jewish News, Bill Leak, Geoff Bloch, Gregory Storer, Marriage Equality, Paul Winter, Waffen-SS, Waffen-SSM, Yael Brender. Bookmark the permalink.